Sinuses are defined as paired air cavities / spaces (pockets) found in the cranial (head) bones. 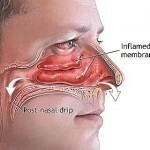 Sinuses are also referred to as “paranasal sinuses”. They are connected to the nose on the facial part of the skull where air passes and mucus drains. There are four pairs of sinus cavities and each cavity opens into the nasal passage so that air and mucus can pass. Unclean mucus travels from the sinus cavities into the nasal passages. Sinuses help to insulate the skull, reduce its weight and allow the voice to resonate within it. They also protect against viruses and bacteria. Sinus infection, or sinusitis, is an inflammation or infection of one or more of the paranasal sinuses caused by bacteria that has traveled from the nasal passages. Sinusitis can result in headaches or pressure in the eyes, nose, cheek area or on one side of the head. 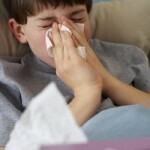 It can also cause coughing, fever, bad breath and nasal congestion with thick nasal secretions. Sinusitis is categorized as acute or chronic which is the most common type. Acute sinusitis will last eight weeks or less or occur for a maximum of three times per year with each episode lasting no longer than 10 days. Acute sinusitis may be caused by a viral infection in the upper respiratory tract, or from allergies. Chronic sinusitis lasts longer than eight weeks or occurs more than four times per year with symptoms usually lasting for more than 20 days. Bacteria and fungi (especially in persons with a weakened immune system) are involved in chronic sinusitis. Eucalyptus oil can be used to relieve nasal and sinus congestion associated with colds and flu. Add a few drops of eucalyptus oil to boiling water in a large bowl. Place face a few inches from the bowl and cover with a towel. Inhale steam for 10 minutes or as desired. Inhale steam using a hot shower, vaporizer or facial sauna to help relieve sinus congestion. Use a salt water rinse to clear the nasal passage as an alternative sinus remedy. Mix together 1/2 teaspoon of non-iodized salt, 8 ounces filtered room temperature water and 1/2 teaspoon of baking soda. Using a bulb syringe, tilt the head down and place the syringe into one nostril. Give it a gentle squeeze so that the water comes out the other nostril. Repeat on the other side. Coughing may occur as fluid drain to the back of the throat. Consume ample amounts of water throughout the day and especially at night before retiring to bed to help clear the airways. Use medicated vapor rubs at night by applying to nose and other nasal areas. In the event of flu or cold, apply vapor rub to chest and back to help ease congestion and sinuses. For external use only! Avoid irritants such as household chemicals and cigarette smoke that will make breathing more difficult. Massage the sinuses by pressing thumbs firmly on both sides of the nose for 15 to 30 seconds, release and repeat. Massaging will temporarily relieve sinusitis because it brings a fresh supply of blood to the area. Drink hot tea made from thyme, garlic or peppermint.